Abstract. In this study, we identify the key message passing interface (MPI) operations required in atmospheric modelling; then, we use a skeleton program and a simulation framework (based on SST/macro simulation package) to simulate these MPI operations (transposition, halo exchange, and allreduce), with the perspective of future exascale machines in mind. The experimental results show that the choice of the collective algorithm has a great impact on the performance of communications; in particular, we find that the generalized ring-k algorithm for the alltoallv operation and the generalized recursive-k algorithm for the allreduce operation perform the best. In addition, we observe that the impacts of interconnect topologies and routing algorithms on the performance and scalability of transpositions, halo exchange, and allreduce operations are significant. However, the routing algorithm has a negligible impact on the performance of allreduce operations because of its small message size. It is impossible to infinitely grow bandwidth and reduce latency due to hardware limitations. Thus, congestion may occur and limit the continuous improvement of the performance of communications. The experiments show that the performance of communications can be improved when congestion is mitigated by a proper configuration of the topology and routing algorithm, which uniformly distribute the congestion over the interconnect network to avoid the hotspots and bottlenecks caused by congestion. It is generally believed that the transpositions seriously limit the scalability of the spectral models. The experiments show that the communication time of the transposition is larger than those of the wide halo exchange for the semi-Lagrangian method and the allreduce in the generalized conjugate residual (GCR) iterative solver for the semi-implicit method below 2×105 MPI processes. 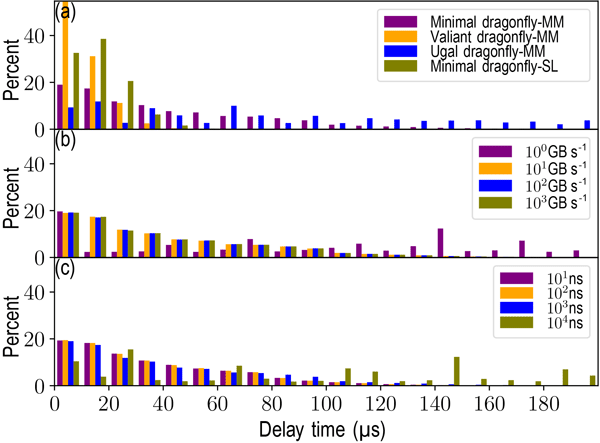 The transposition whose communication time decreases quickly with increasing number of MPI processes demonstrates strong scalability in the case of very large grids and moderate latencies. The halo exchange whose communication time decreases more slowly than that of transposition with increasing number of MPI processes reveals its weak scalability. In contrast, the allreduce whose communication time increases with increasing number of MPI processes does not scale well. From this point of view, the scalability of spectral models could still be acceptable. Therefore it seems to be premature to conclude that the scalability of the grid-point models is better than that of spectral models at the exascale, unless innovative methods are exploited to mitigate the problem of the scalability presented in the grid-point models. 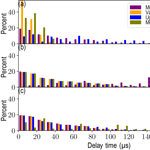 How to cite: Zheng, Y. and Marguinaud, P.: Simulation of the performance and scalability of message passing interface (MPI) communications of atmospheric models running on exascale supercomputers, Geosci. Model Dev., 11, 3409-3426, https://doi.org/10.5194/gmd-11-3409-2018, 2018.